LPL Market Signals Podcast. In case you missed last week’s podcast, listen to Chief Investment Strategist John Lynch and Senior Market Strategist Ryan Detrick reflect on their memories of the financial crisis, and discuss the changes in today’s market landscape 10 years later. Please join our discussion on social via #LPLMarketSignals. China cancels trade talks. Last week’s optimism that trade talks would resume faded this morning as China canceled future negotiations, citing the U.S.’ continued tariff threats as a roadblock. The U.S. imposed $200 billion in additional tariffs on Chinese imports today, and China has pledged to retaliate with a $60 billion round of tariffs on U.S. goods. While we still think the U.S. and China will eventually reach an agreement on trade, it is unlikely to come before the mid-term elections. Dow’s fresh highs. The Dow joined the S&P 500 Index at fresh new highs last week after a drought lasting nearly eight months. In this week’s Weekly Market Commentary and in our latest LPL Research blog post (both due out later today), we discuss the Dow’s new high and whether stocks have enough support from economic growth and corporate profits to build on recent gains. History tells us that new highs after long droughts tend to be followed by further gains, and that the likelihood of a recession in the next 12 months is very low. Fed preview. The Federal Reserve’s (Fed’s) monetary policy meeting is the highlight of this week, culminating in a policy decision and a press conference from Fed Chair Jerome Powell on Wednesday. An interest rate hike later this week is almost a foregone conclusion, so investors will likely focus more on the Fed’s projections for future policy and economic growth. In this week’s Weekly Economic Commentary, we’ll highlight what we’re watching for in the upcoming meeting. The week ahead. Along with the Fed meeting, we’ll also get a series of top-tier data out of the U.S., including consumer confidence, second-quarter gross domestic product (third revision, Bloomberg consensus +4.2%, prior revision 4.2%), and the Fed’s preferred inflation measure: core personal consumption expenditures (consensus +2.0% YoY). 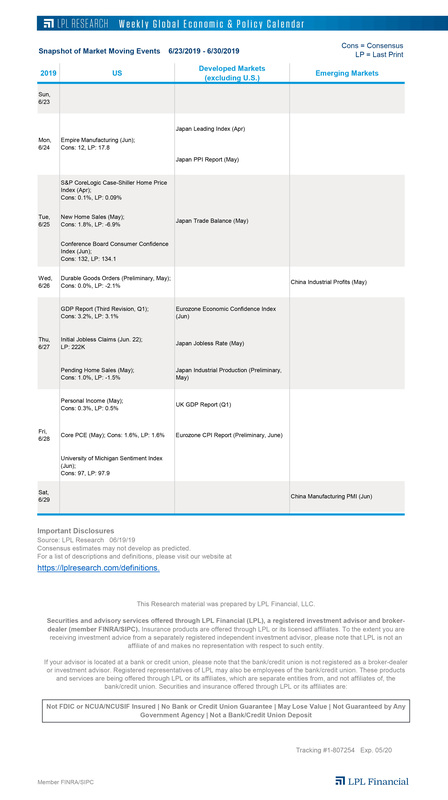 The overseas docket is relatively light, with Eurozone consumer inflation, producer prices in Japan, and Purchasing Managers’ Index data out of China likely to garner attention. Track these and other important events on our Weekly Global Economic & Policy Calendar.